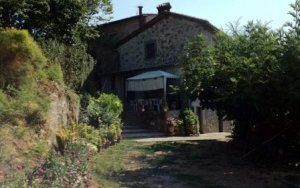 Pleasing fully renovated village house with terrace, set in the medieval hamlet of Fabbriche di Valico in the Garfagnana. The fixtures and finishes are to a very high standard, the property wwill include all the furniture a fittings. Ground floor – the front door leads into the kitchen come dining room, the kitchen is to a high contemporay specification and is included in the sale. On this level is the bathroom, with shower, sink and wc. The boiler is housed in a space adjacent to this room. First Floor – the is a stone staircase with elegant contemporary lighting, the is a spacious living room with fireplace, modern sofa and built in shelving. The chestnut beams and wooden floors. Second Floor – the is a wooden staircase that leads up to this floor where the is a bedroom with very pleasing views and a walk in wardrobe. All the fixture and fittings are new and the furniture is included in the sale. 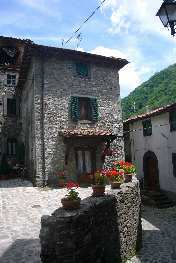 Included in the sale is a terrace in the piazza in front of the property with a large space below used for storage.